and a choice of five food and beverage venues. and the stores and entertainment at Paseo Herencia. 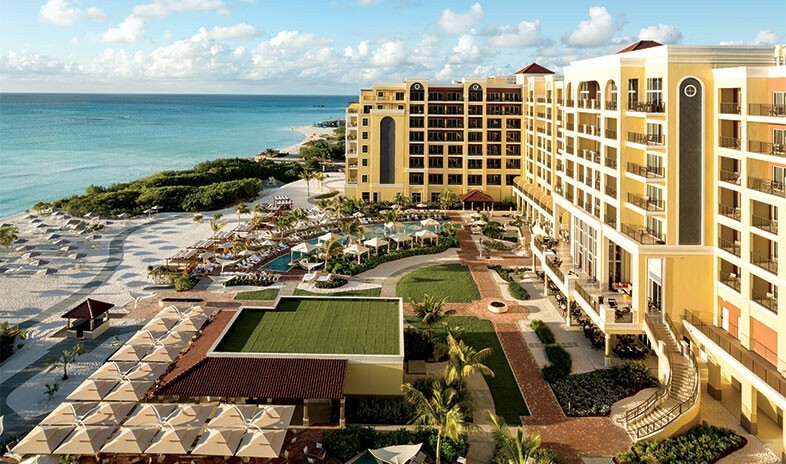 Located 15 minutes from the capital city of Oranjestad on Palm Beach, The Ritz-Carlton, Aruba epitomizes the phrase “island paradise.” It’s reflected in everything from the crystal-clear water and powdery white beach to the indulgent suites and delectable cuisine. With all the amenities on-site, guests can alternate between serene relaxation and exciting recreation. Two beachfront pools feature jaw-dropping views and luxurious cabana rentals, while the 15,000-square-foot spa offers herbal-inspired natural treatments, as well as a fitness center with yoga and other classes. Once recharged, guests can try one of the many available water sports, such as snorkeling and sailing, or hit the tables and slot machines at the 24-hour casino. Groups gather in 10,000 square feet of indoor meeting rooms, as well as poolside and beachfront venues. The hotel can also arrange Impact Experiences that allow event attendees to give back to the local community. Activity options include creating cards for a pediatric hospital, cooking meals to be donated to a hunger relief organization, and venturing off-site to work at a sanctuary for Aruba’s dwindling donkey population. After a day of volunteering, meeting, and playing in the sun, it’s time to retire to the property’s elegant rooms and suites, all of which feature private balconies overlooking the Caribbean Sea. Discerning guests should book a room on the seventh-floor Club Level, which offers more personalized service and access to an exclusive lounge with floor-to-ceiling windows.